All participants dial-in, enter a passcode and collaborate. The chairperson can mute all participants. Participants can self mute their phone line. An invoice marked 'paid' is sent to account owner monthly. 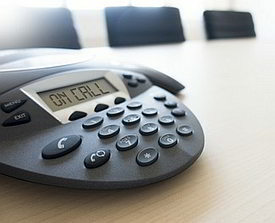 Moderator can control the conference call online with PC or Mac. Default settings are below. Keep or change these settings now or modify anytime. Enjoy limitless conference calling without concerns about call frequency, call length or usage minutes. Upon receiving the account activation email, your account can be used 24/7, whenever you need to host a conference call. You'll always have operator assistance and Customer Service to assist with any clarifications or questions that may come up. I certify that the account information submitted is true and correct. This unlimited flat rate service is pre-paid by credit card. I can cancel the service anytime by phone or email. If after account activation should my credit card change, I will notify company immediately. I agree to pay for account usage within the terms of the invoice received. I understand the dial-in access number to this plan is a standard U.S. phone number and not a toll-free number.